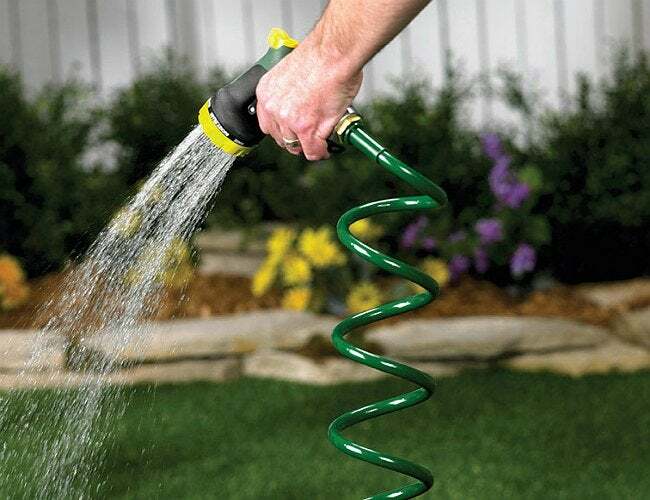 Forever prone to kinks and tangles, traditional garden hoses are a hassle to handle and store. Much more manageable by comparison, coiled hoses make for a tidy alternative, particularly for those who have smaller outdoor spaces to maintain. Is your green thumb confined to a small space? If you’re watering window boxes, a container garden on your deck, or a tiny backyard oasis, then a coiled garden hose may be your best bet. What makes it a smart buy? For one thing, although it stretches to meet your needs, a coiled hose always returns to its tight, compact, spring-like original shape. Lightweight, durable, and, most importantly, kink-free, coiled hoses come in a variety of colors and lengths (most measure 15 or 25 feet long). Being half an inch in diameter, somewhat smaller than traditional hoses, the coiled variety come with reduced flow and pressure. But what draws people isn’t their performance—it’s their convenience. A word to the wise, though: Once you let go, these hoses quickly recoil, so be a bit careful about what you leave in its path.